SPARS is a high-rise emergency escape device, which can be used when traditional evacuation methods are impossible. All over the world, more than 10,000 skyscrapers stand at 100m or higher. The construction of high-rise buildings is seen as a sign of development. It is, therefore, not surprising that the number of skyscrapers around the world is on the increase and the trend is expected to continue. Safety is an important consideration when constructing high rise structures and regulations all over the world stipulate that standard emergency evacuation means should be provided. According to the SPARS website, the device is an ‘Autonomous Rescue Pneumo Transformable Chute Back-Pack System’ that provides a useful alternative when traditional evacuation methods are impossible. SPARS is manufactured by Space Rescue Systems LLC, a Russian company that specializes in aerospace technology. 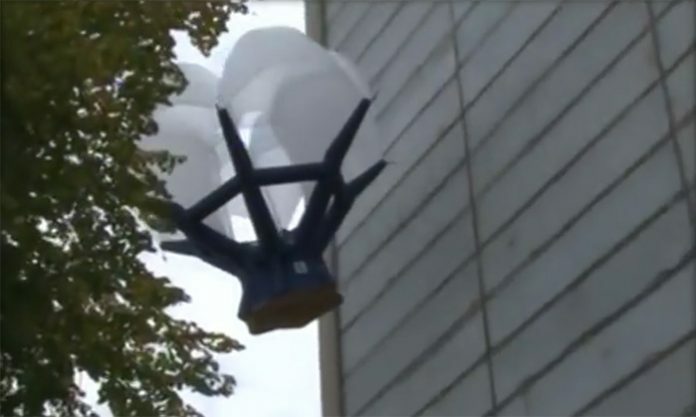 Essentially, the device is an inflatable aerodynamic decelerator equipped with a ring parachute. The parachute is forced open by an inflatable frame that is integrated with airbags. The superior construction and attention to detail facilitates easy use and guarantees injury-free landing. According to the manufacturers, the device is also capable of floating on water and is reusable. When completely assembled, SPARS weighs 25kg and the suspension system is easy to activate. This is particularly important as it is designed to be usable for everyone, even without prior training. The device can support anyone with weights ranging from 45 to 150 kg and it can safely evacuate individuals from buildings as high as 1000m. This makes it suitable for skyscrapers, offshore platforms, towers, and similar buildings. Ideal weight for a backpack-type device. Information available on the manufacturer’s website shows that the company is currently searching for partners that would aid the final production and marketing of SPARS.